The Kamnik-Savinja Alps (aka Kamniško-Savinjske Alpe, Steiner Alpen) are a stunning mountain chain in Slovenia. 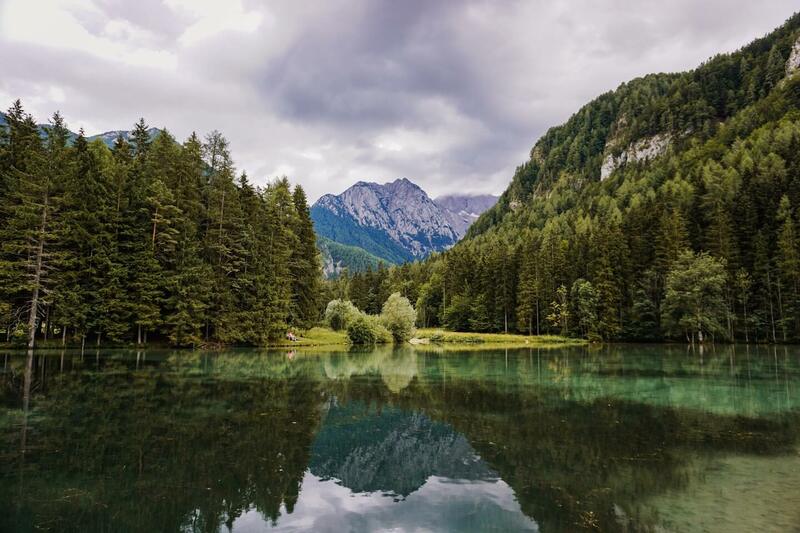 Located only 1.5 hrs north of Ljubljana, this alpine paradise is accessible by car, or by public transit. 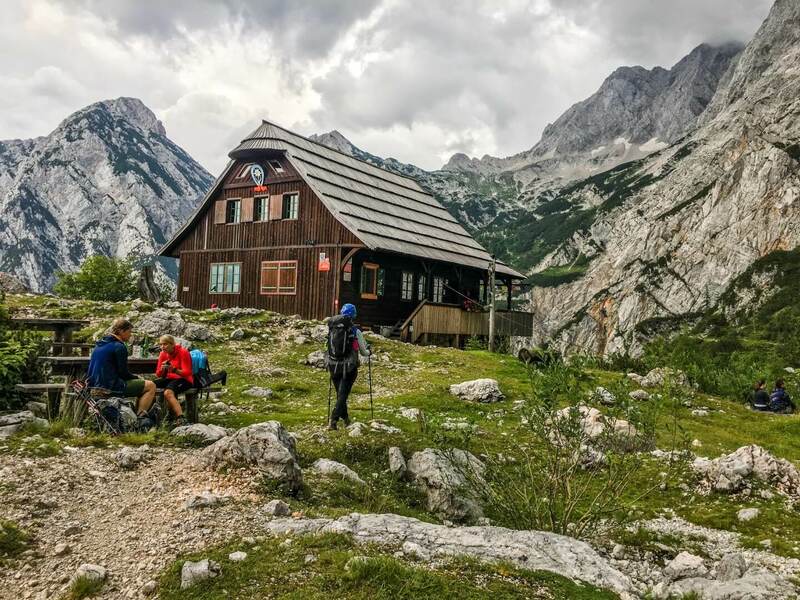 In July, we hiked hut-to-hut for four days in the Kamnik-Savinja Alps, starting in Kamniška Bistrica and ending in Zgornje Jezersko. Much of our route followed the Slovenian Mountain Trail (marked with the number “1”), a 599 km long trail that takes 28 days to complete. We were blown away by the incredible beauty of these limestone mountains. We were also astonished by how few people were actually on these trails. 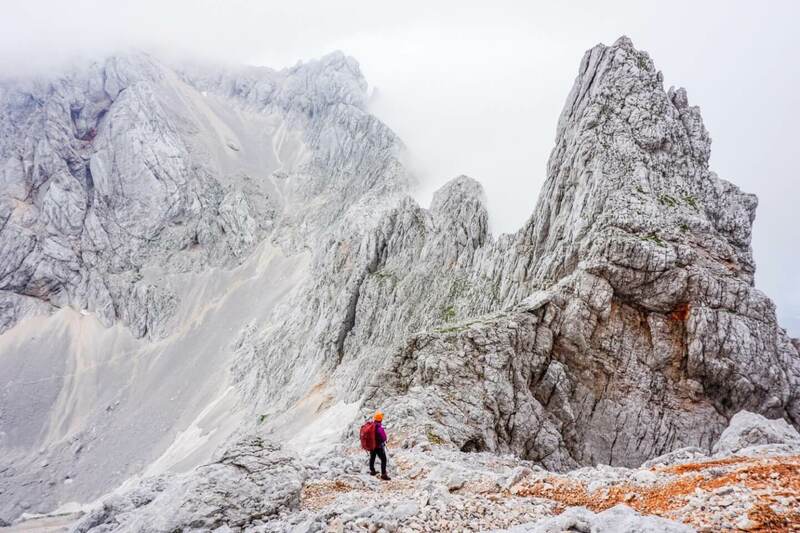 Compared to the Julian Alps, the Kamnik mountains are far less trafficked. Our 4-Day hiking tour was a challenging trek. 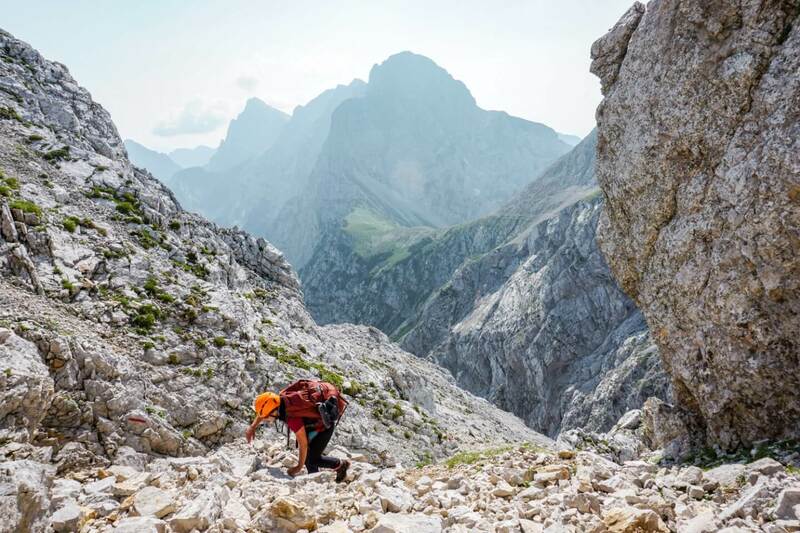 If you have alpine hiking experience and proper equipment (via ferrata kit), this is definitely a hike for you. 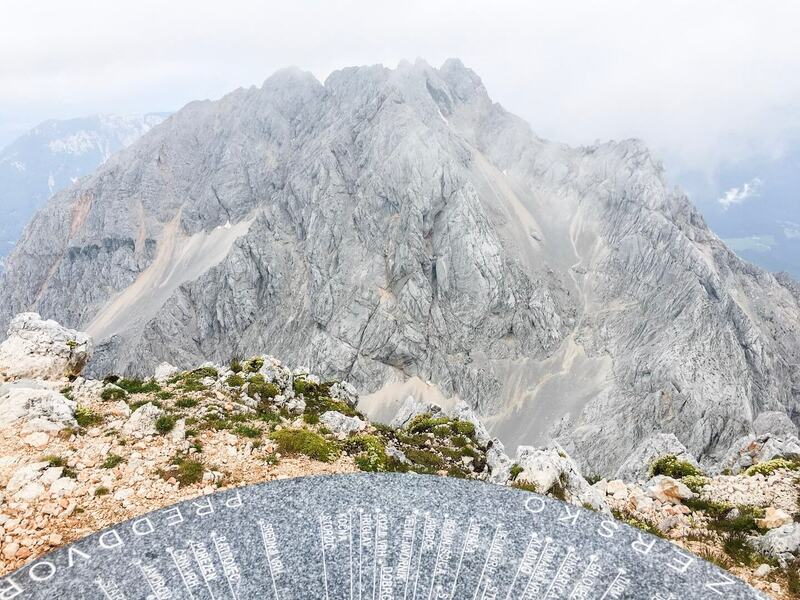 If you love the mountains but aren’t thrilled about assisted climbing routes, consider hiking stage 1 and, or stage 4 of this guide as day hikes. 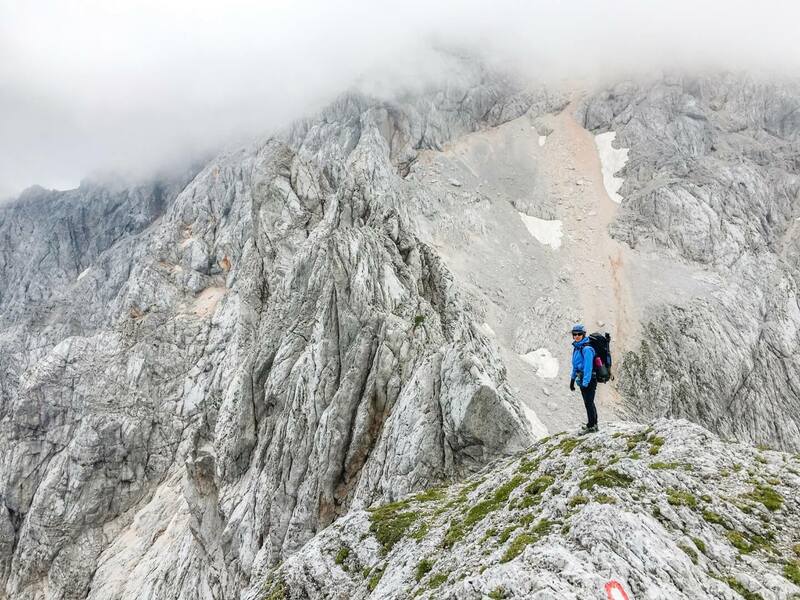 Also, check out our Triglav National Park trek in the Julian Alps. 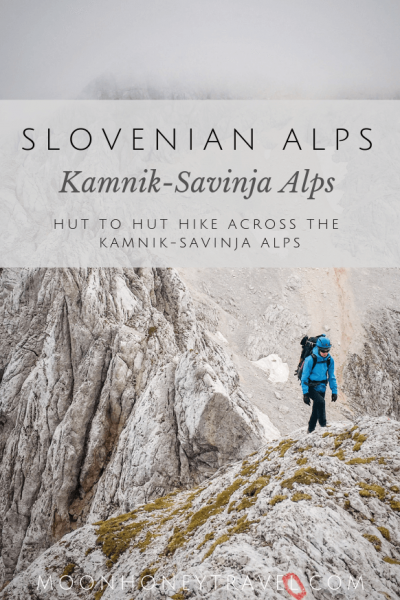 This hiking guide outlines each stage of our trek through the Kamnik-Savinja Alps. 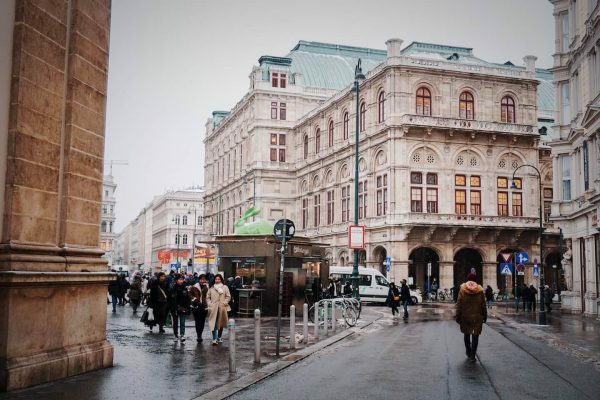 We’ve also included tips on how to save money, what to pack, and where to stay. 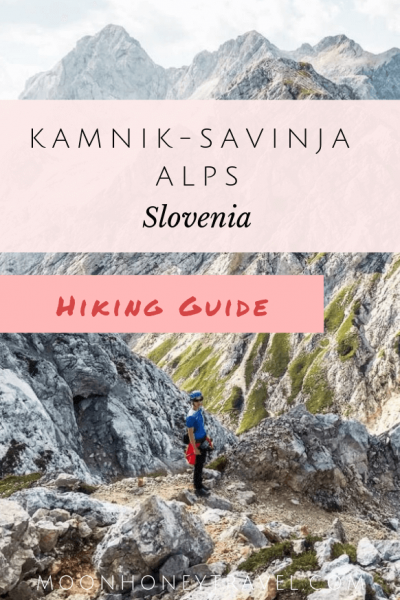 Where are the Kamnik-Savinja Alps? 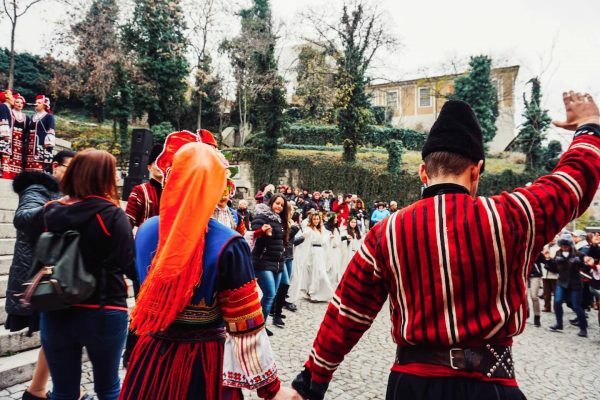 Where are the Kamink-Savinja Alps? The Kamnik-Savinja Alps (Kamnisko-Savinjske in Slovenian) are located in Northern Slovenia, close to the Austrian border. They make up the south-easternmost part of the Alps and the southernmost part of the limestone alps. These mountains are also known as the Steiner Alpen, or Steiner-Sanntaler Alps. 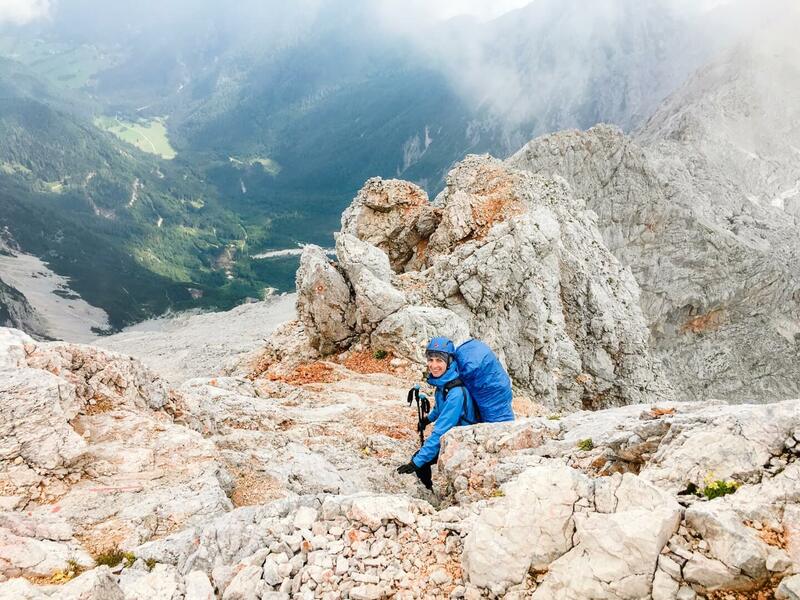 We recommend the Grintovci 1:25 000 for all hikes in the Kamnik Savinja Alps. The hike to the mountain saddle Kamniškem sedlu begins at the mountain hut Dom v Kamniški Bistrici in Kamniška Bistrica. To reach Kamniška Bistrica by public transit, you can take a direct bus (20 minutes) from the town Kamnik. There are frequent buses from Ljubljana to Kamnik. 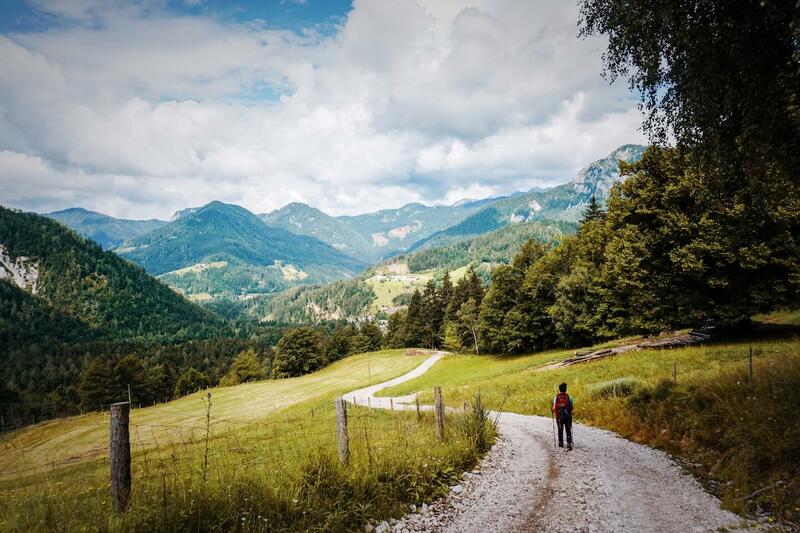 If you’re arriving in Ljubljana, you could catch a bus to Kamnik and spend the night there, before making your way to the trailhead the next day. Look for accommodation in Kamnik. 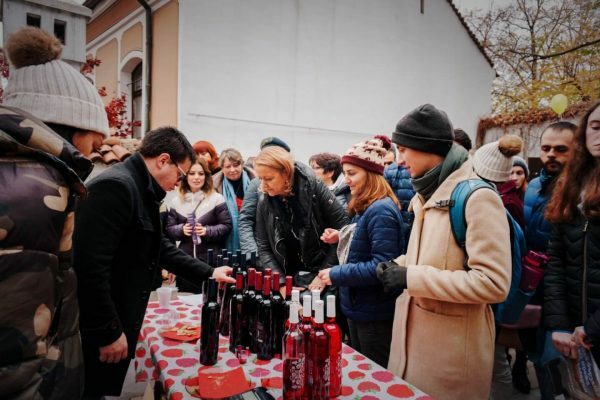 Alternatively, you could catch the Kamnik to Kamniška Bistrica bus, and spend the night at Dom v Kamniški Bistrici, which is located directly at the trailhead. Stage 1 can easily be done as a day hike. Though continuously uphill, it’s a manageable trail that isn’t technically difficult. 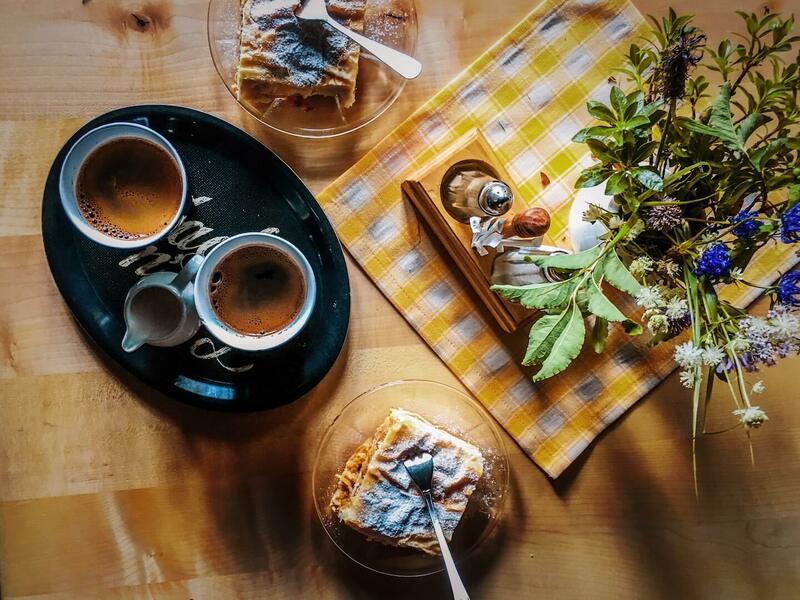 For those looking for a taste of the Kamnik-Savinja Alps, this is for you. This hike takes 3.5 – 4 hours. The trail begins at Dom v Kamniški Bistrici. Follow the paved road from the hut to a small parking lot. At the parking area, there will be red signs indicating the direction to Kamniškem sedlu (our trail) and Kokrskem sedlu. The trail begins steeply and ascends through the forest via a narrow path. Simply follow the trail markers, which are white dots surrounded by red circles. After 2 hours of hiking through the forest, you’ll reach a resting area with an A-frame shelter called Pastirji. Soon after the shelter, you’ll clear the bush and walk into a glorious meadow covered in wildflowers. From here, you’ll see the beautiful limestone mountains Brana and Planjava. After the meadow, the trail continues to ascend to the mountain saddle. The destination of Day 1 is a mountain hut situated on a green meadow at the saddle between Mount Brana and Mount Planjava. After lunch and some rest, we decided to hike to the summit of Mount Brana. It takes about 1.5 hours round-trip. It’s a rocky climb that requires the use of both hands in many places and some scrambling. There are some assisted ropes to aid with your ascent and descent. Though you don’t need a full via ferrata (Klettersteig) kit for this, you should wear a helmet. 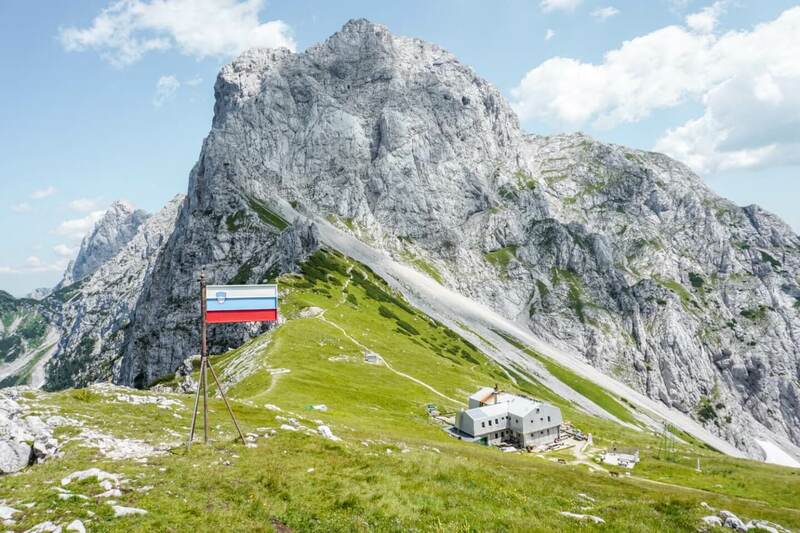 This Slovenian mountain hut offers dormitory and private rooms. Showers are provided at no extra cost. Charging is available at no extra cost. 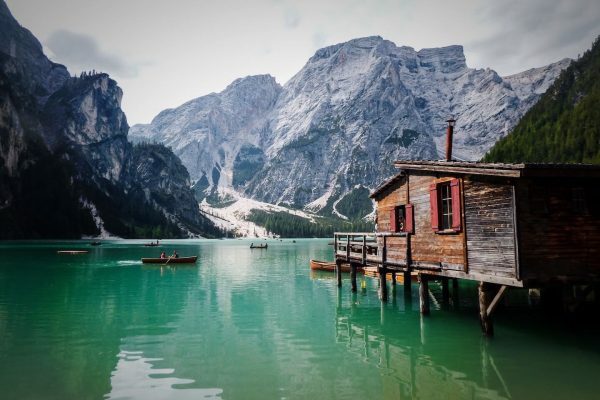 The best part about this hut is its location. The outdoor seating area is perfect for soaking up the sun and enjoying the sublime alpine environment. The food was okay. We won’t oversell it. The hike today is challenging and technically difficult. 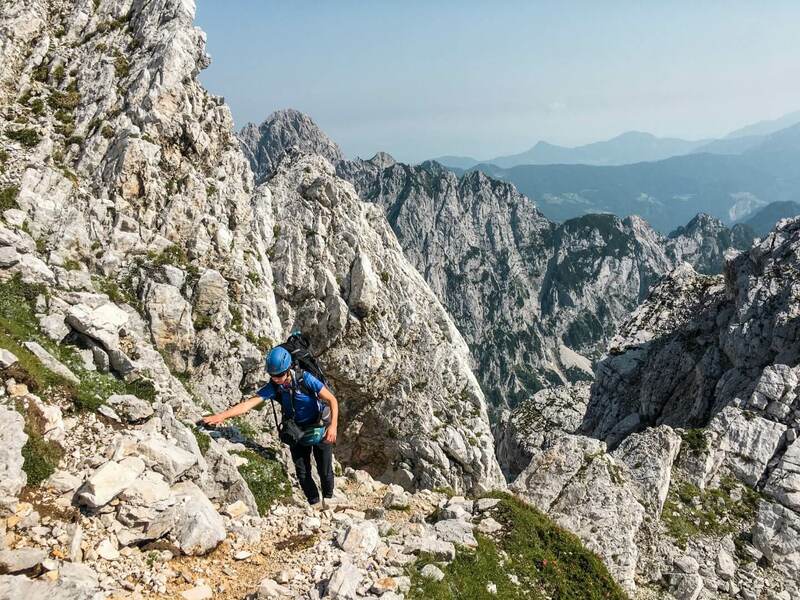 A huge segment of the trail is a supported climbing route, aka Via Ferrata, or Klettersteig. 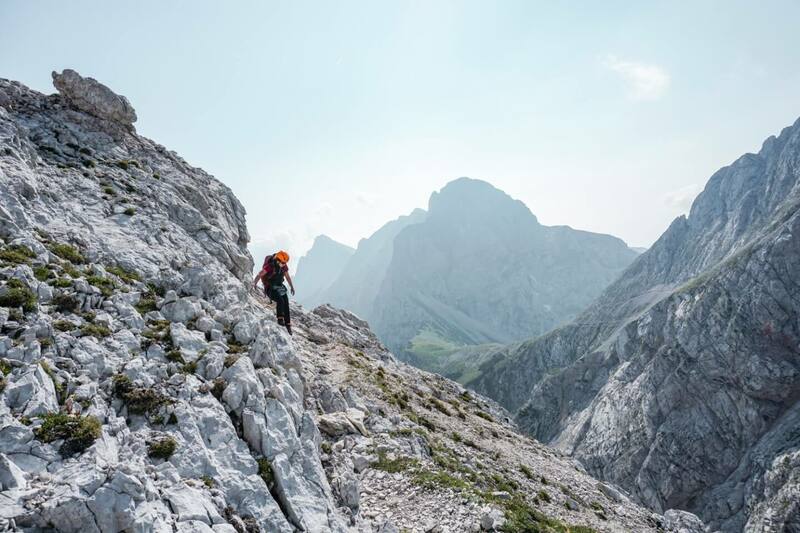 While you don’t have to have a ton of via ferrata experience to successfully hike this trail, you should have alpine hiking experience and the right equipment (helmet, via ferrata set). The trail takes officially 6.5 hours. It took us 8 hours (with breaks). From the hut, follow the trail towards Mount Brana. There will be an intersection marked by red signs, indicating left and up to Mount Brana and straight towards Turska Gora (mountain). The trail to Turska Gora initially plummets abruptly. Your descent is aided by fixed ropes, footholds and other climbing aids. You’ll need both of your hands for much of this trail. 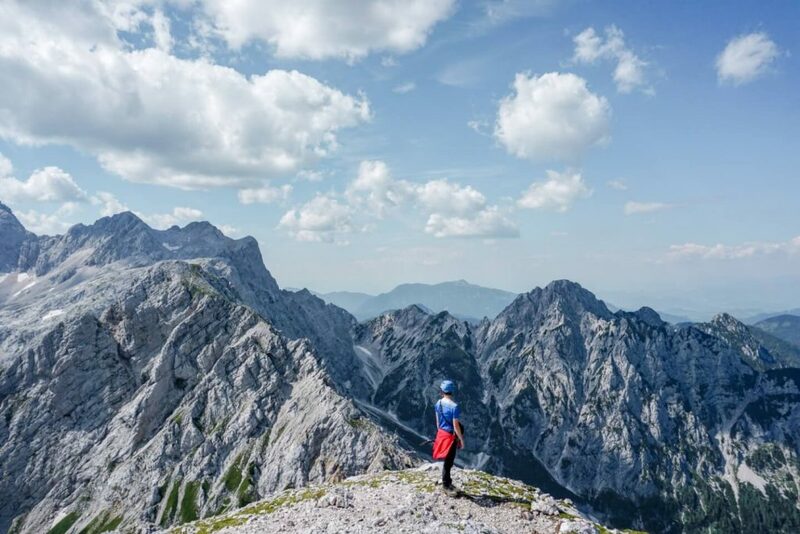 The first few hours of the trail requires concentration as you manage the via ferrata segment to the summit of Turska Gora (2251 m). If it’s raining, don’t attempt this trail – it’s not safe. From the summit of Turska Gora, the trail descends gently. To reach the mountain hut Cojzova koča, you can decide between the trail via Sleme (presumably the easier way) or via Skuta (2533 m). We opted for the former. The trail traverses a high plateau characterized by slabs of limestone, scree, and boulders. At Mali Podi, the beautifully designed shelter Bivak pod Skuto na Malih podih (2045 m) is reachable via an unmarked footpath to the left (according to Maps.me). We didn’t do a detour, because of the thick fog and our desire to get to our destination before any rainfall. There’s another via ferrata segment about half way between Turska Gora and the modern shelter, Bivak Pavla Kemperla pod Grintovcem (2104 m). From the black box-shaped shelter Bivak Pavla Kemperla, it’s another hour to the final destination Cojzova koča. 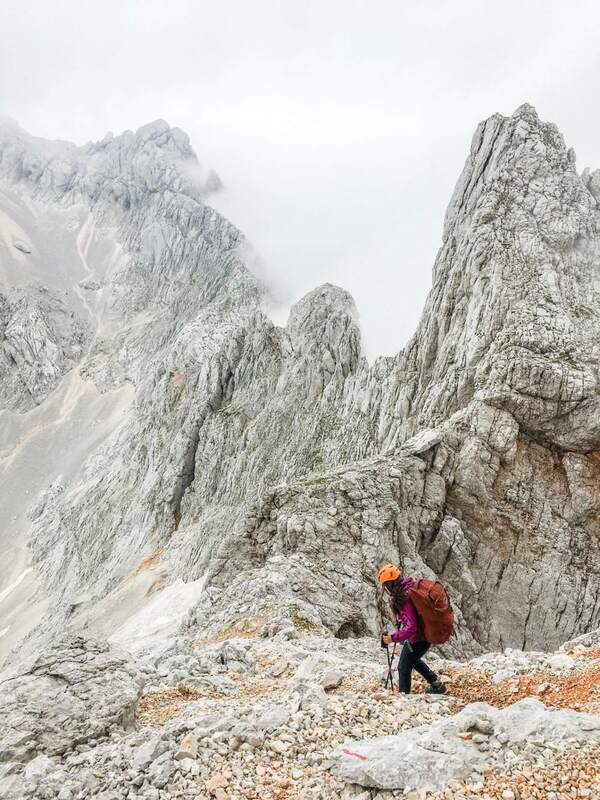 Cojzova koča sits on the Kokrskem sedlu mountain saddle. It’s a splendid sight when you finally get a glimpse of the mountain hut straddling the saddle. The hut has private rooms as well as shared dormitory rooms. The walls are paper-thin, so make sure to bring earplugs. For bathroom facilities, there is running water sourced by rain. However, there’s no shower. The food was definitely an upgrade from the night before. 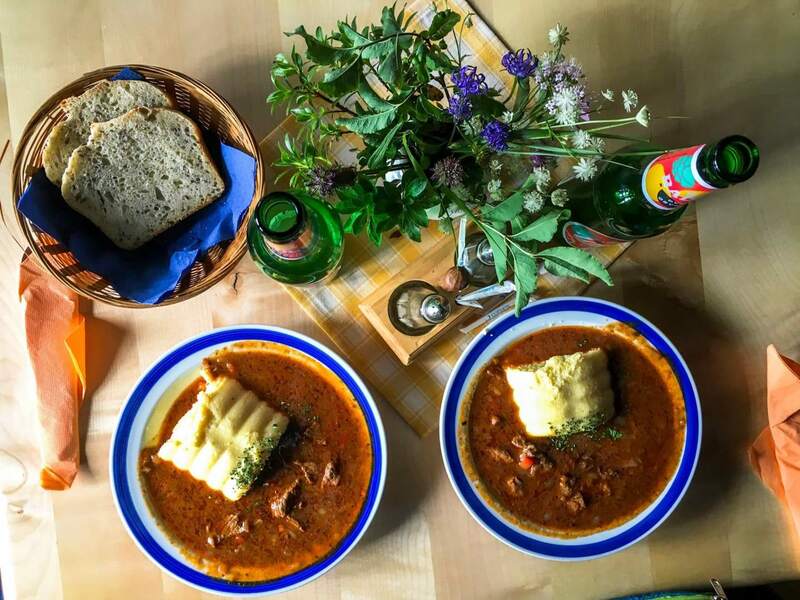 We ate the Goveji Loned, a stew with vegetables and ground beef, as well as their goulash. 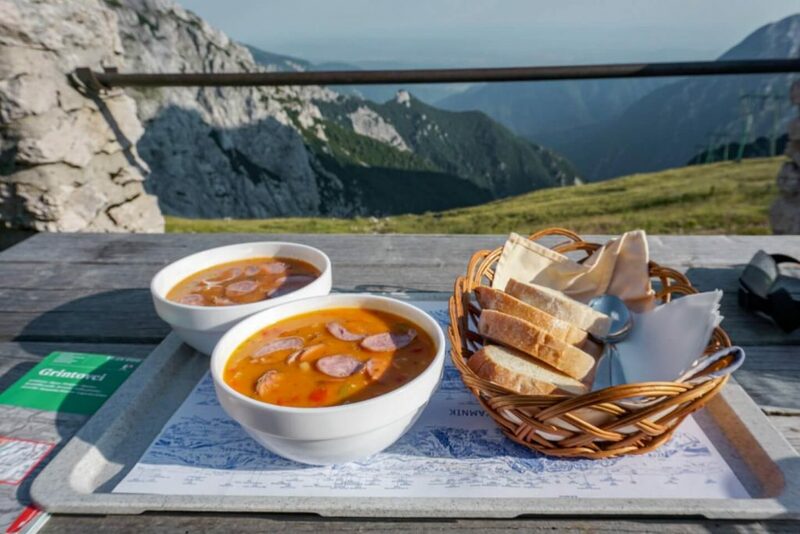 We also tried the traditional Slovenian dish Jota, which is a bean and sauerkraut soup. Day 3 is as challenging as Day 2. It requires a fair amount of scrambling and use of both hands. 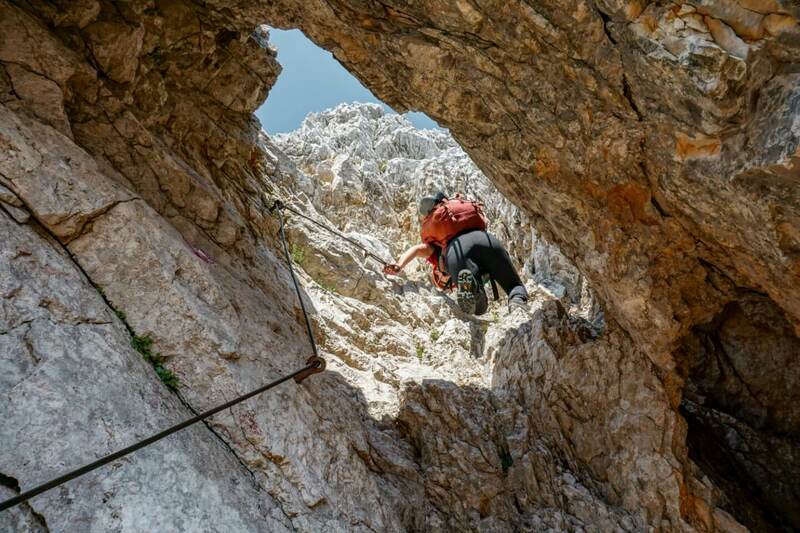 Though the route is partially secured, there are challenging parts that require concentration and a strong head for heights. 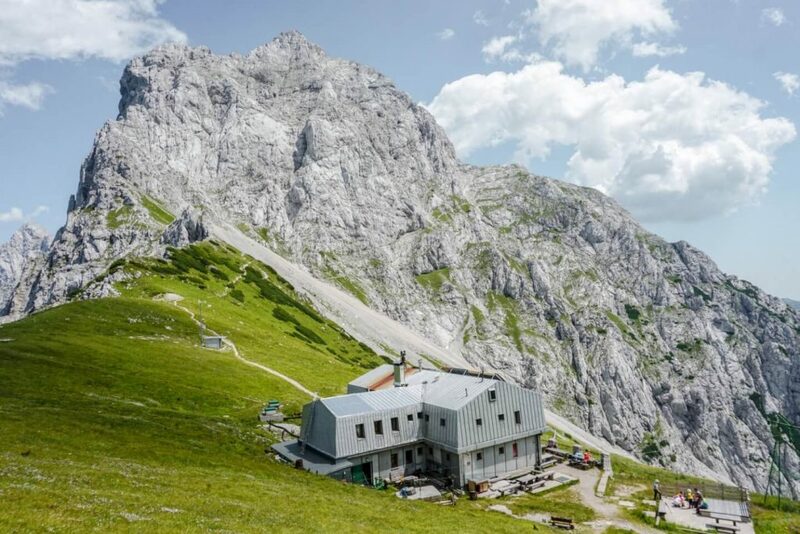 After summiting the highest peak in the Kamnik Alps, you’ll climb a mountain ridge and descend through scree to the charming mountain hut Češka koča. Only hike this route in good weather. The hike today officially takes 7 hours. It took us 9 hours with breaks. The hike begins surprisingly gently as you make your way to Mount Grintovec. It takes 2 hours to reach the summit. Unlike the ascent, the descent is significantly trickier. Soon after you start the descent, you’ll be faced with a short via ferrata / klettersteig segment that was challenging (especially if you’re not a tall European man). The trail is exposed and requires sure-footedness. 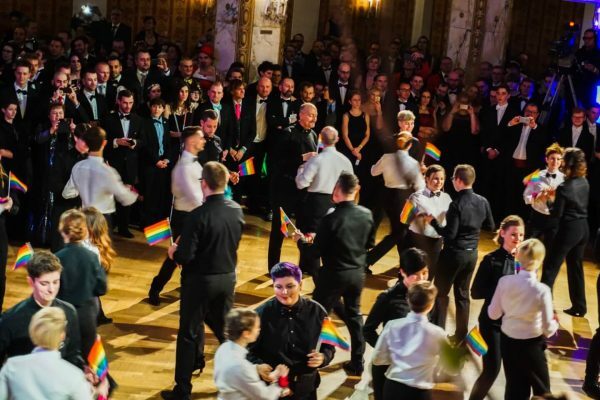 For more info, read Summitpost’s Grintovec. After the via ferrata, the trail will split. You can go left and towards Dolška škrbina (the “easier” route), or right and towards Mlinarsko sedlo (the more difficult route). We opted for the left trail. 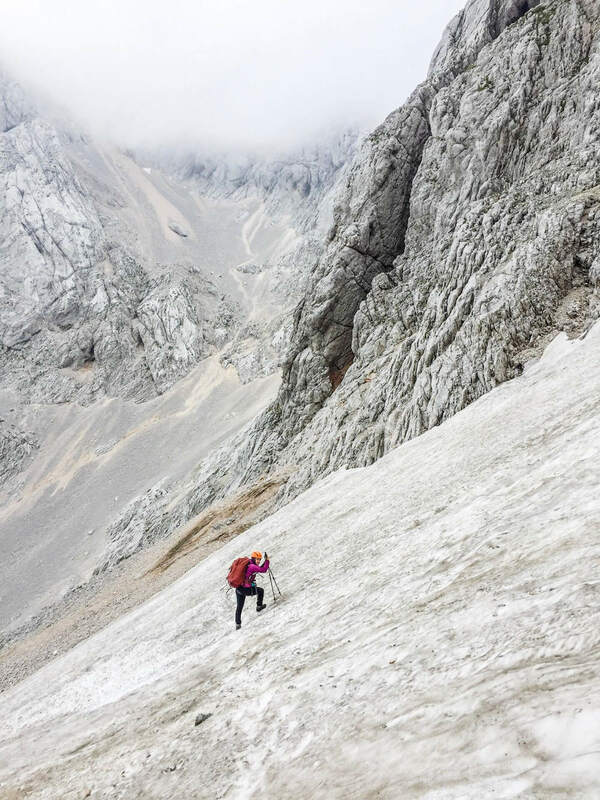 Dolška škrbina (notch) is basically the saddle between Grintovec and Kočna, or better described as the lowest point of the ridge. The path down Grintovec is mostly characterized by loose rocks and scree. Though we were hyper-focused on our footing, we were able to admire the devastatingly beautiful peaks around us. After hiking Spremova pot (trail) and traversing a steep snowfield (hiking poles were essential), we followed the trail markings in the direction of Kočna. The trail leads you vertically up a ridge, which you’ll follow for some time. 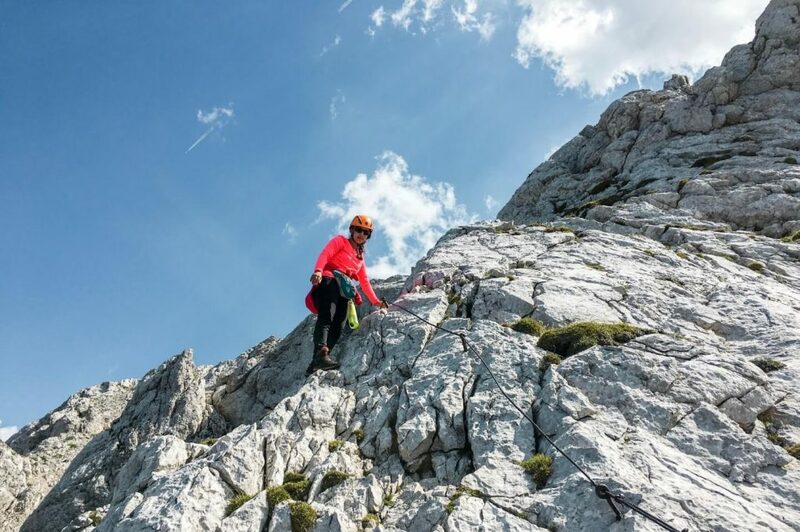 Next, the trail turns into another assisted climbing route (via ferrata), called the Kremžar route, Kremzarjeva pot. This secured path was unforgettable. The mountains envelop you and you’ll have magical views of the Ravenska Kočna valley. For more info, read Summitpost’s Kremžar route. 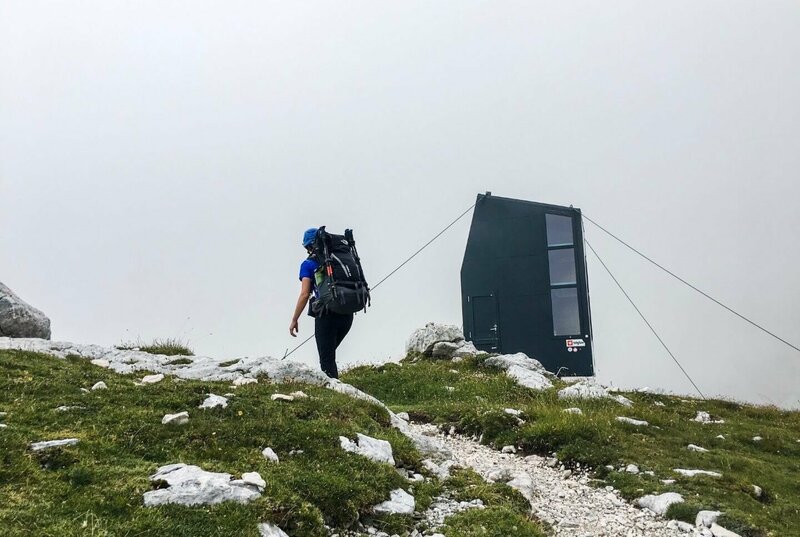 The trail continues and ultimately intersects with the trail from Mlinarsko sedlo at 1800 m.
You’ll continue along difficult terrain towards your ultimate destination Češka koča, the Czech Hut. This last stretch traverses scree slopes, so please be extra careful. This was our favorite hut in the Kamnik Savinja Alps. 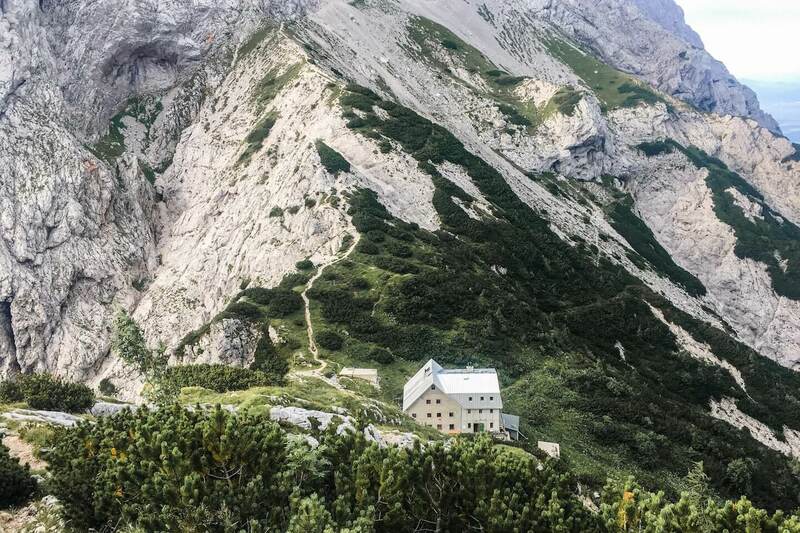 Dating back to 1900, this mountain hut has barely changed in a century. There’s ample outdoor seating as well as a cozy interior dining room. The hut offers shared sleeping quarters. You can either sleep in a shared room or the dormitory room in the attic (cheaper). There’s running water, but no showers. Day 4 rewards you with an easy finish. We slept in as long as possible and enjoyed a slow breakfast. 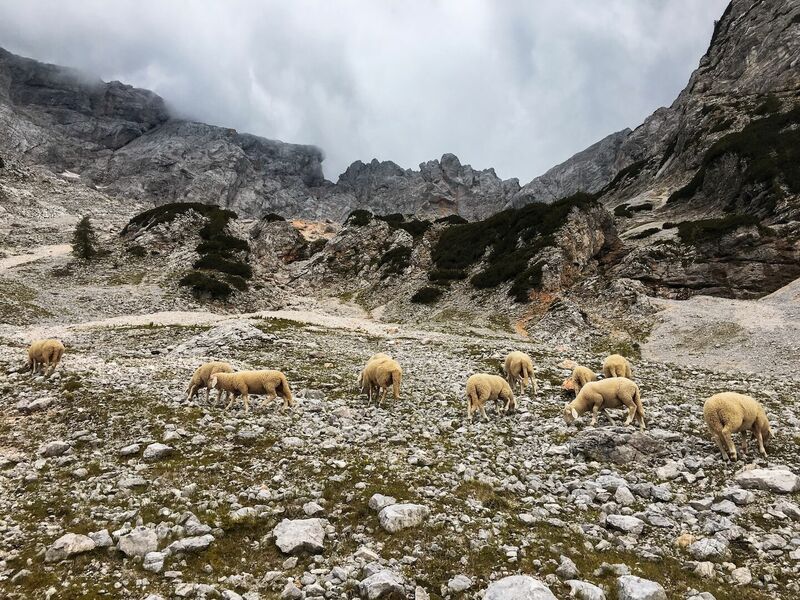 There’s absolutely no hurry today, as the hike to the village Zgornje Jezersko takes only 2 hours. Follow the Slovenian Mountain Trail #1 in the direction of Jezersko. After 20/25 minutes, the trail will split. You can take the left trail through the forest, or the right trail through the Ravenska kočna valley to Jezersko. We opted for the left trail because it had rained all night and we were informed that it would be less slippery. However, we believe the trail to Ravenska kočna is far more scenic. The forest trail (#1) was a welcome relief to our tired feet. However, if we’d do it again, we’d opt for the valley trail. The trail intersects the road and it’s a short walk into the village. 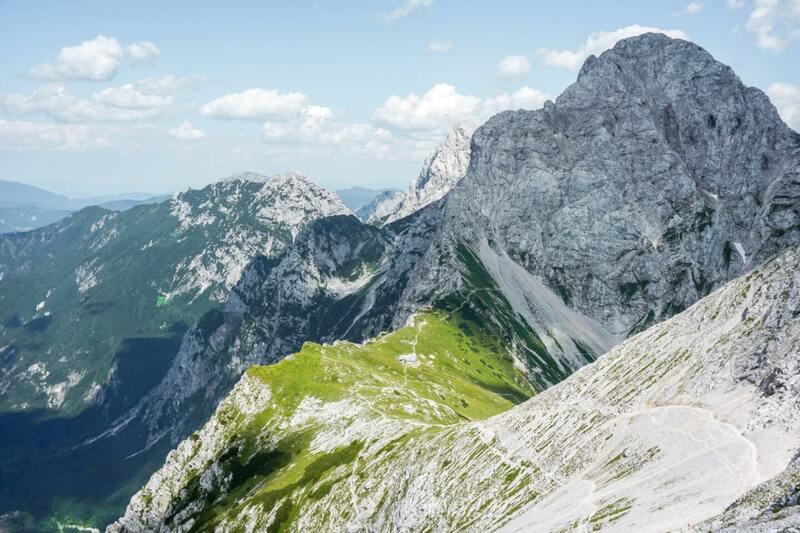 From the road, you’ll have jaw-dropping views of the Kamnik Alps. 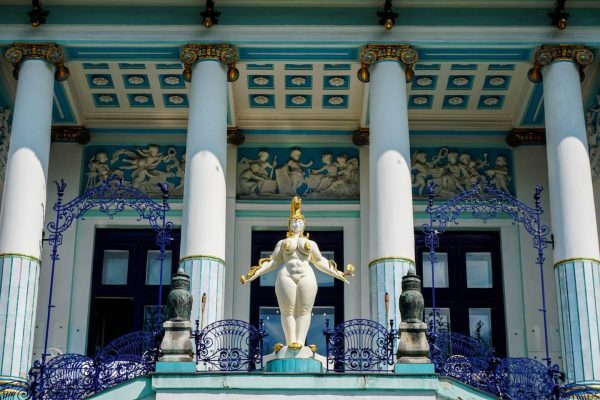 From Stara Pošta, it’s a 110-minute walk to the beautiful lake Planšarsko jezero. At the lake, you’ll find the restaurant, Gostišče ob Planšarskem Jezeru. We had a delightful dinner here.